I'm always trying new ways to prepare vegetables so when I came across this recipe on Pinterest I knew I'd have to give it a try - cherry tomatoes, mozzarella and olive oil ..... what's not to like? The recipe came from Proud Italian Cook - it's really worth having a look as it's full of lovely recipes Italian inspired. I did adapt it a bit as the ingredients in my fridge were a bit different, I used cheddar because that's what I had and I put fresh basil into the courgettes just because we like it. Cut the courgettes in half along the length. Scrape out the seeds with a teaspoon. Brush the cut surface with a mix from the oil, garlic & pepper. Lay some torn basil leaves in the bottom then put 5 halves of tomatoes in. Cover the dish loosely with foil and cook for 15 minutes. 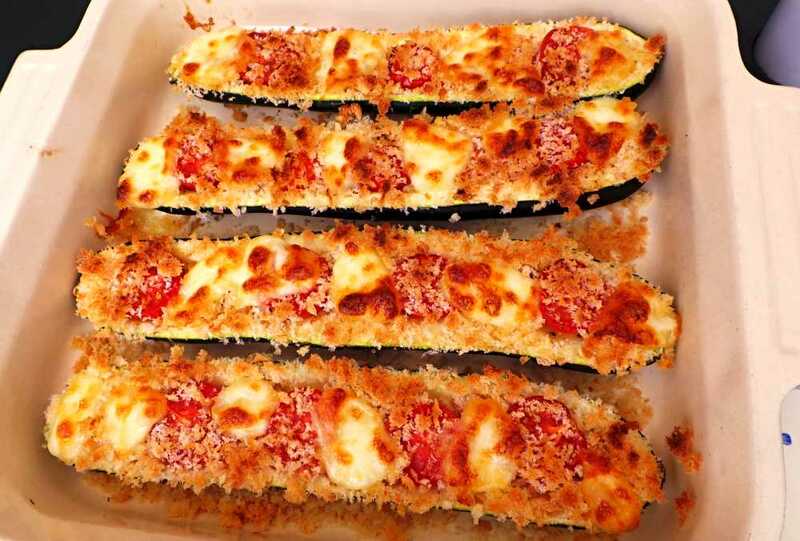 Remove the foil and place pieces of torn mozzarella in the courgette shells. Sprinkle over the cheddar and then the breadcrumbs. Return (uncovered) to the oven for a further 15 or so until the cheese has melted & the breadcrumbs are browned and crispy.